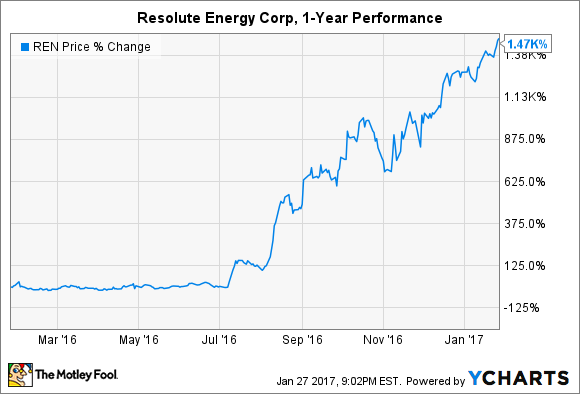 Will Resolute Energy Corp. Stock Sink or Swim? The stock is up 1,470% in the past year. What happens now? Since I told investors it was time to start thinking about locking in impressive gains from Resolute Energy Corp. (NYSE:REN) last November, the stock has gained 69%. I originally pointed out that the minefield passing as a balance sheet and a questionable valuation outweighed the promise of rising oil prices and new assets in the Delaware Basin. Apparently, Mr. Market sees things a little differently. While management has wisely taken steps to decrease leverage and improve the debt-to-assets ratio, investors may be wondering if the stock is getting lost in its own momentum. Looking ahead, will Resolute Energy Corp. stock sink or swim? Clearly, the stock has been swimming just fine in the last year, boasting gains of 1,470%. That has been aided by smart management moves in the last two months. In December, management offered 4.37 million shares of stock at $38 per share to raise net proceeds of $160.8 million. The funds will be applied to repay the second lien secured-term loan and a portion of the balance on the company's revolving credit facility. The moves will save $14 million in annual interest expenses, or about $0.71 per share. Considering that the balance sheet showed $634 million of total liabilities at the end of September, management was wise to take advantage of a sky-high stock price to repay a solid chunk of debt. The stock has only continued to extend its gains after the share offering. Moreover, the company's acquired a further $135 million in assets in the Delaware Basin after the close of the third quarter of 2016, which will further help to boost the debt-to-assets ratio. More financial flexibility certainly makes investors more comfortable, but the driving force behind the stock's momentum has been, and will likely continue to be, rising production. Resolute Energy Corp. ended the third quarter of 2016 with average daily production of 16,000 barrels of oil equivalent, or boe/d. That represented a 29% increase from the prior-year period. What's more, operations were churning out 20,000 boe/d exiting the year. Management expects the growth to continue throughout 2017, guiding for organic production growth of 85% for the year ahead, or an average of 26,000 boe/d at the midpoint. The company's current development inventory puts 311 wells on investors' radars, but Resolute Energy Corp. thinks all of its Wolfcamp assets could eventually support a total of 632 wells. That hints that production increases won't end after the year is over. Indeed, management crudely suggested that midpoint production of 35,000 boe/d was a way-too-early expectation for 2018. That definitely supports enthusiasm for the stock. However, profitability could still be a difficult goal for 2017. Management guided for capital expenditures of $210 million to $240 million this year. Considering that revenue for the first nine months of 2016 registered at just $102 million, it seems likely that investors are in for another year of losses, even with the impressive production gains on the horizon. I appear to have misread Resolute Energy Corp., although I have a difficult time thinking the stock has earned its currently lofty valuation. That could tame gains for investors using current prices as their starting point. That aside, there's no denying the company has had an overnight reversal of fortunes thanks to strong production from its living-up-to-the-hype Delaware Basin assets. Production gains and healthier crude oil prices should continue to support the company's stock price. Investors are now waiting for one important question to be answered: Can new drilling programs be completed without continued losses for the foreseeable future? Unfortunately, it could take years to find the answer.